No doubt the best leopard picture we’ve ever captured! – Dr. Guy Balme. 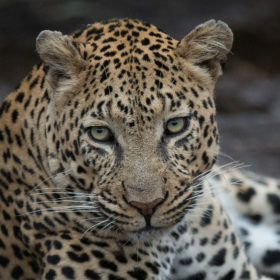 When a renowned leopard biologist who also happens to be the director of the Leopard Program for Panthera, the world’s premier big cat conservation organization, makes that claim, you know it’s not simply spurious. After over 100 camera-trap surveys run across South Africa since 2013, with in excess of 5 million images taken and over 10 000 leopard captures, we were quite pleased to have Guy say this about the absolutely phenomenal image below, of the Ndzanzeni young male leopard taking down an adult Nyala cow in broad daylight, while a panic-stricken sounder of warthogs flees in the background. The photograph was taken on the 20th of this month at just after 1pm as part of a camera-trap survey being conducted by Panthera (more on this in the next while), and I think can lay to rest any notion of leopards being exclusively nocturnal for one thing. For those who don’t know what a camera-trap is, it’s a remotely activated camera equipped with some kind of trigger (the ones in this study use infra-red sensors) left in the field to capture images of animals when researchers aren’t present. If no other leopard images are captured on Londolozi during the 50-day survey currently underway, the image above will still make it a roaring success! 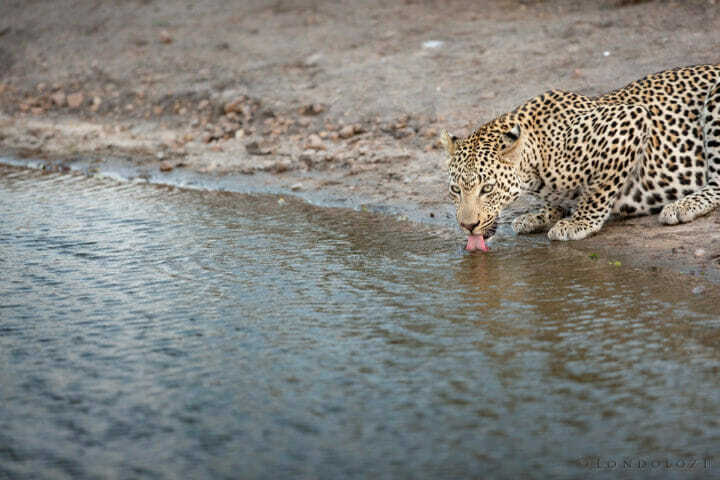 After a number of blogs written about the male leopard in question, and his apparent refusal to become independent, it seems almost fitting that it was at this particular waterhole (just out of picture to the right), where he is regularly to be found, that he made this giant leap towards adulthood. The day after this capture, his father the Inyathini male was found next to the water, his belly full, clearly indicative of him having fed on a kill. 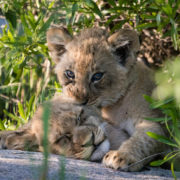 About an hour after he was found there, the Ndzanzeni male himself arrived to drink, and lay down only a few metres from his father, who showed no aggression towards him. The Inyathini male – suspected father of the Ndzanzeni young male – looks up as his son approaches the pan. The Ndzanzeni young male, his full belly evident, emerges from the thicket line to approach the waterhole. After a big meal, leopards usually head to the nearest water source to drink. There wasn’t unanimous consensus among the field team whether it was the father or son taking down the nyala, but spot pattern recognition software revealed it be the young male. The Inyathini male would most likely have stumbled upon the kill, and being significantly larger than his son, would have had no trouble in appropriating a chunk of it for himself. Two days after the original image was captured, head trainer for the Tracker Academy, Renias Mhlongo, and his students were searching for leopard near the pan, found tracks, and with no prior knowledge of the camera-trap photo or what had happened, recreated the scene from just the footprints. 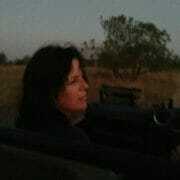 Renias reported that two different males had been there but ultimately the kill had been stolen by hyenas. Both leopards have since moved on, but with the camera trap project in place for another three weeks, and stations set up all over Londolozi, we can’t wait to see what the next batch of photos turns up! on The Most Incredible Camera-Trap Leopard Photo Ever? Wow! 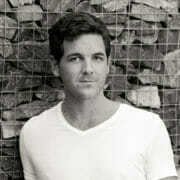 It is just getting better with each new blog. Amazing capture. 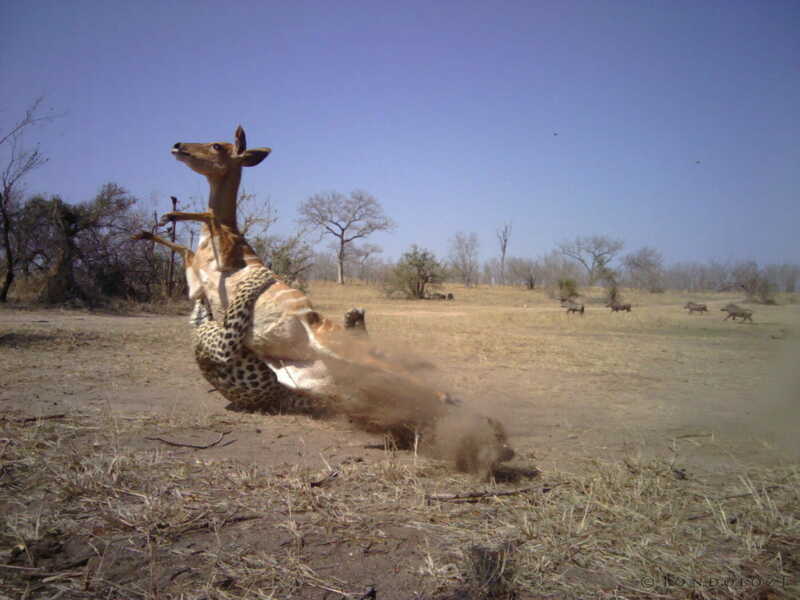 Usually all you get on a camera trap is the animal moving through. This is stunning. Amazing capture for everyone involved in this study including all of you in Londolozi. 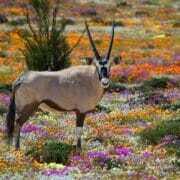 Good to know the Ndzanzeni male is foraging in his own and seemingly getting along with his “father “. What a picture. What an energy inside. And thats with atrap. Great. So incredible . What a great shot. Glad to see the Ndzanzeni has made the necessary transition towards adulthood. What a giant leap (literally) into independent adulthood by Ndzanzeni! For one who has been a bit tardy to total independence, he took on a huge animal. No laggart now! Seeing his arm wrapped around his victim show his strength and determination. Amazing image. 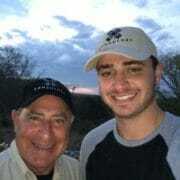 A benefit for the study and a bonus for Londolozi….canvas worthy! That’s an awesome photo! Strength, drama, fear, violence – all at play in one shot! Amazing! 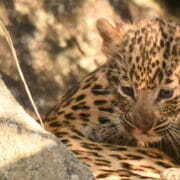 Certainly unusual for the young leopard to have displayed such pluck and stealth. Daytime hunting certainly is not unusual as I have seen a number of times at Olifant’s Camp in KNP as well as in Niassa, Northern Mozambique. The object behind the nyala ewe interests me – looks like an old tree stump smoothed by rhino rubbing? Absolutely, we see daylight hunting here all the time, I was just wanting to get rid of a common misconception about leopards for people who haven’t observed them in the wild before. James, so I used my reading glasses to look again and then I was embarrassed to see I was referring to the the left hind paw of the leopard… Blush! Phenomenal ! So grateful to everyone for their work in supporting these cats. I am guessing that the interaction between male leopards and their progeny is not as uncommon as once thought. 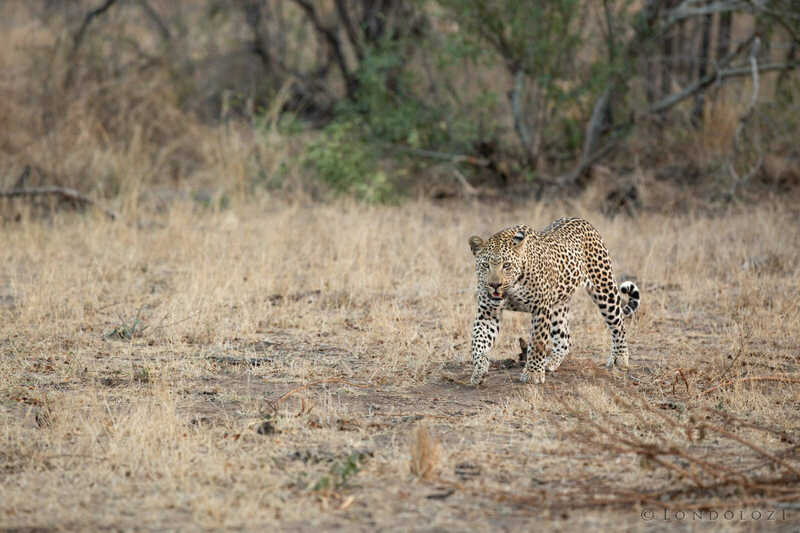 In the North they have Hosana who likes spending time with his ‘father’ Tingana and also his 1/2 sister Thandi. It is amazing to watch leopard dynamics taking place and re-writing the books! Thank you for sharing! 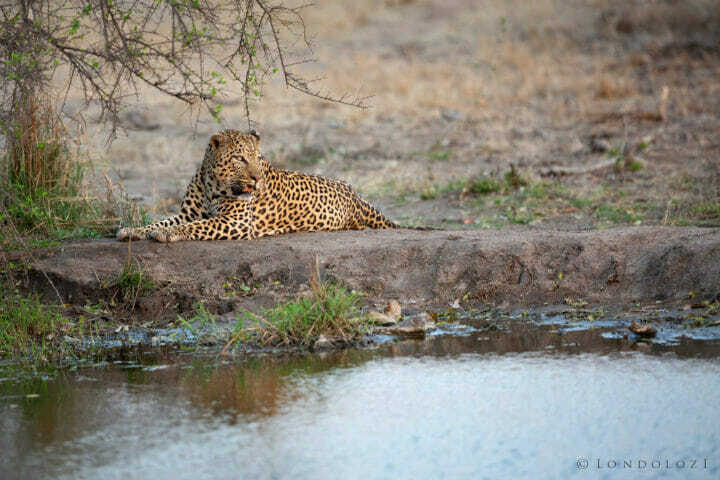 Incredible.. !See that a Young leopard is also hanging around the “Vuyatela” Djuma waterhole & also been seen with his father & his mom sister & her cub. Very interesting leopard behavior. I’ve seen some pretty incredible stuff on camera traps, but this is next level!! Accidentally stumbled on this site. I am a wildlife filmmaker and photographer working on a documentary on leopards in India. This is one of the most incredible image of a leopard that I have come across. I simply can’t believe that this has been captured in a camera trap. Awesome guys. Keep up the good work. PS: I am not surprised about the daytime kill. We aren’t either as the leopards here regularly hunt in the daytime. We just wanted to squash a common misconception among some people not familiar with the cats that they are strictly nocturnal. Superb camera trap photo! And superb kill from this young boy… I wonder whether it will ever get as widely spread around the world as the picture of his grand mother, the Dudley Riverbank female, when she caught and took down a fully grown female kudu. She was only 16 months old !!!! I am sure many of your readers have seen this photo of a young leopard hanging from the kudu’s throat. Good genes! It makes you feel like you were there. James, It looks like fairly open country where the shot was taken, would the young leopard have eaten on the ground or would it have dragged its prey under a thicket? I only ask as the weight differential must be large and hoisting such prey must be difficult?